My wife and I recently returned from a trip to Ireland. We had come primarily to explore places in County Donegal where my wife’s Irish ancestors had lived before coming as immigrants to America in the 1800s, but we also delighted in seeing the sights and hearing traditional Irish music. Arriving in Dublin, we spent the first three days touring around that wonderful city, which included seeing the Book of Kells, a richly illuminated Gospel Book from about 800 A.D. This and many other marvelous illuminated manuscripts were produced in the monastery of Iona, on an island off the western coast of Scotland, founded by St. Columba (521 – 597). At the end of the eighth century there were many Viking raids on Iona, and the monks brought all their finely illustrated books, as well as the saint’s relics, to the monastery of Kells (founded by Columba about 550 C.E.) in central Ireland. Here they were kept relatively safely until the mid-1600s, when, threatened by Cromwell’s forces, they were moved to Dublin. The way north in our rental car led us through Kells, where we stopped to get picnic food. We hadn’t been thinking of St. Columba at all, but a man who took us under his wing to direct us to the supermarket insisted on showing us the round stone tower and oratory, where some of St. Columba’s relics had been kept. Once in Donegal one of our journeys took us to an area known as Church Hill, where my wife’s Callaghan ancestors were tenant farmers. The area was quite close to Gartan, St. Columba’s birthplace. In fact, I believe we found some graves of some of her relatives in a place called Tulach-Dubhglaise, anglicized as Temple-Douglas. It was here at Templedouglas that St. Columba received his name Colum, or “dove”, at his baptism by a priest named Cruithnechan, who was also one of his tutors. 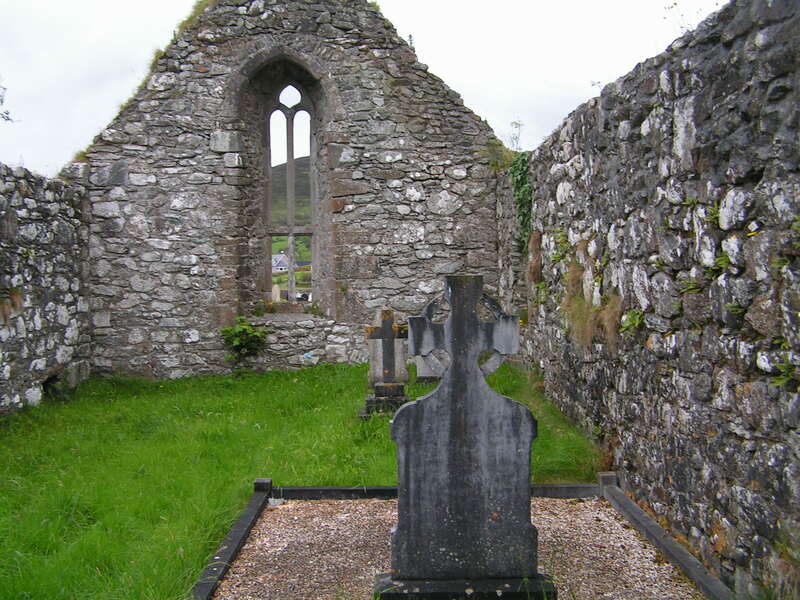 I took the picture from within the ruins of the monastery – it is quite common for cemeteries to be built around holy places like this, so that one could be buried where saints had trod. The Irish monks of the sixth century had been much on my mind recently, since I’ve been collecting various things of interest on the history of Compline. I had been surprised to find that, among monastic groups, the Irish had some of the most severe liturgical practices, deriving from the third-century Egyptian monks. The practice of “continuous prayer” had been carried over to southern Gaul (France) by monks like John Cassian (see my blog Deus in adjutorium), and these “Gallican” chants and practices influenced St. Patrick and others who studied in Tours and Auxerre before returning to Ireland as missionaries in the early fifth century. The ideal was to pray without ceasing, whether by oneself or in community – although there were communal times which varied from two to eight times a day. But the main part of the liturgy was to chant the psalms in groups of three called chorae, with a common “office” being four chorae (twelve psalms), with other antiphons, hymns, and prayers. The Irish practice of psalmody was at its most severe in the “three fifties”, where all 150 psalms were sung in three groups, along with other chants and prayers. The rule was, no food until all 150 psalms had been sung! There is a book of antiphons, hymns, and prayers associated with the office called the Bangor Antiphoner, which was either written or completed by Irish monks at Bobbio Abbey, near Milan. The abbey was founded near the end of his life by St. Columbanus (540 – 615), who with twelve companions set out about 580 on a mission to the non-Christians in France. The Bangor Antiphoner probably not only contains much of the liturgical practice in Ireland, but may more accurately reflect contemporary Gallican practice. There were three night “hours”: at nightfall (Initium Noctis), midnight (Medium Noctis), and early morning (vigilae). Initium Noctis, which corresponds closely with Compline, had a candle-lighting ceremony or lucernarium, twelve psalms, antiphons, and prayers. It concluded with a rite called Ad pacem celebrandam, in which forgiveness of sins is asked “that we may not fear from nocturnal fear”. Now that day has run its course and night has come, let us pray to the mercy of God, that, our minds filled with divine things, we may be able to renounce the works of darkness. Amen.